This begins with a cinematic animation in which 2 ninjas duel to the death; one goes down. 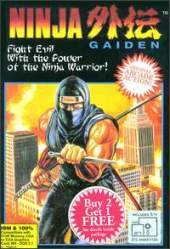 It is revealed that the doomed ninja is the father of Ryu Hayabusa. When Ryu learns of this, he embarks on a quest to find out who killed his father and why. This quest takes him to America to find an archaeologist with whom Ryu's father was working. From there, Ryu becomes embroiled in an evil, supernatural conspiracy involving a villain named Jaquio who has plans to use an ancient castle and some relics to unleash a terrifying evil upon the world. In comparison to the better known console version this game is based on the original arcade version. It is a traditional fighting game similar to Double Dragon in which the player walks from left to right while battling numerous enemies. Only if all foes are dispatched of, the player can advance in the level. It's also possible to perform special attacks and use weapons. The latter are either collectable power-ups or environmental objects like phone booths.